The best one-word description of the Art Guild of Pacifica’s Annual Members Show is “grand.” Art Guild members bring their best works to this show, making it a joy to see and a real celebration of art in Pacifica. 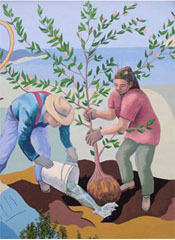 This year’s show marks 20 years of the Art Guild having a permanent home for this annual exhibit at Sanchez Art Center. The 58th Annual Members Show opens Oct 7, and runs through Nov 13, filling both East and West Galleries. An opening reception will be held from 7 to 9 pm on Friday, Oct 7, with music provided in the East Gallery by Vivacé, with Rob Hughes (flute) and Alan Lee (piano). In the Main Gallery music is by guitarist Mark Sessler. Jennifer Farris and Rab Terry of Studio Gallery in San Francisco will select this year’s merit and exhibition award winners, and the four 2016 exhibition award winners will exhibit in the Main Gallery in fall 2017. Exhibiting in the Main Gallery this year are Joel C. Fontaine, Charles Dennis McDevitt, Nancy Mona Russell, and Wendy Thieler, the four exhibition award winners selected in 2015 by artist and Skyline College instructor Jody Keane. Charles McDevitt’s oil and acrylic paintings portray realistic images of manmade objects in natural sunlight and shadow, in a manner sometimes approaching photorealism. McDevitt’s works for the awards show are all acrylic on canvas, 40” x 30” in size. His subjects are mid-twentieth century home appliances and toys, to which he brings a sense of warm appreciation and compassion. Nancy Russell is an abstract painter who works in acrylics and oil sticks. Her award-winning piece, titled Push, was done in oil stick. According to the artist, her works are either abstractions of visual memories, or the results of a process of discovery. Russell often highlights her bright colors with a liberal use of white, making for happy, joyous images that uplift and enliven the viewer. Wendy Thieler is a photographer, painter, and collage artist. Her award-winning photograph, Plant Life II, looks like a painting, capturing the light and shadow on folds of fallen tree bark. Her part of the awards show will include photographs and mixed-media collage works. Thieler’s photography is notable for the sensitivity with which she approaches her subjects, and she brings the same delicate touch to her collage materials. The four award-winning artists will talk about their work on closing Sunday, Nov 13, at 4 pm in the Main Gallery, with Jennifer Alpaugh, Art Guild of Pacifica President, moderating the discussion. Also happening on Nov 13 is Open Studios, with twenty Sanchez Art Center studio artists opening their doors to visitors from 11 am to 5 pm. There will be all kinds of art to see—jewelry, photography, painting, assemblage, colored pencil drawings, weaving, printmaking, and mixed media. You can explore the studios, engage with the artists, and ask questions about their work. There will be live art demos as well, offering another chance to explore various techniques and approaches. Sanchez Art Center is located at 1220 Linda Mar Blvd in Pacifica, about a mile east of Highway 1. Following opening night, galleries are open Friday, Saturday, and Sunday, 1–5 pm, and by appointment, through Nov 13. For more information call 650.355.1894 or email info@SanchezArtCenter.org.